Somewhere in high school, I bought a new Bible. Until that point, I’d been using a copy that my grandparents had given me upon my baptism in 1999. I loved that copy. They had given me a New American Standard Bible with my name on the front. That Bible was my first “grown up” Bible, meaning that it didn’t include Adventures in Odyssey comics (which were awesome, by the way). That Bible still holds a special place in my heart. But in high school, I felt the time had come for a change. Quick note on context: I grew up in church. I was the good kid, perfect hair and all (friends from FBC Kenner still remember how crisp my hair was every Sunday from my mom combing and hairspraying it in place). Because of this, I didn’t notice a dramatic change when I gave my life to Jesus. I can look back and see how the Lord began to convict me of sin, and I can trace his hand through those years, but I didn’t encounter a huge lifestyle change; my behavior remained largely the same. I had embraced Jesus as my Savior, but I didn’t realize my need for Jesus as Lord until high school. At that point, I caught fire and began to pursue a deeper knowledge of him. I think that’s about the time I decided to buy a new Bible. 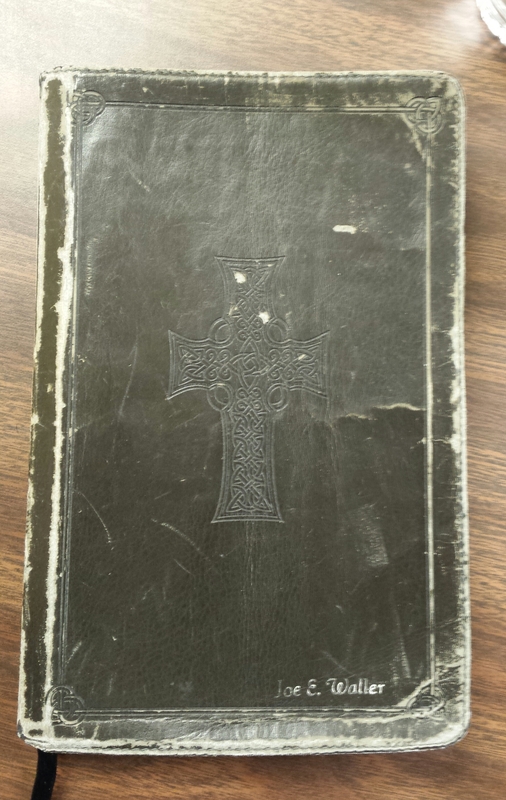 So I found the one: A black English Standard Version with a cool cross design on the front. This would become my Bible for years to come, the Bible that I would invest in more than any other before it. This is the Bible I would carry with me in this new stage of my pursuit of God. Little did I know just what that road would look like, nor did I realize how greatly God would use this copy of his Word. When I started college at Northwestern State University in little old Natchitoches, LA, I knew five people, give or take. For the first semester or two there, I spent a lot of time alone in my room just reading the Bible. As I got to know people, they used to joke about me having four to five hour quiet times each day. On some level, that’s not too far off. The Word of God was my closest friend in those first few months. I got to know God better as I studied his words, and I began to notice a growing desire to share the truths he was teaching me. That first year found me studying through Paul’s letter to the Romans. As I read and underlined and highlighted my way through Paul’s arguments, my soul was stirred. I can remember thinking one day that people needed to hear what Paul had to say, and, almost immediately, I remember recognizing that I could potentially share the message. The thought of starting a Bible study began to take root in my mind and heart, and I began to seriously pray about that possibility. This began my journey into ministry and my love for the book of Romans. From that point forward, ministry opportunities began to surface around me. The summer between my freshman and sophomore years at school, I was asked to lead a small group at my school’s Baptist Collegiate Ministry. As I got more involved there and at FBC Natchitoches, I became friends with more people who hungered and thirsted for the Word of God, which spurred me to pursue God more wholeheartedly through the pages of his Book. By the time I started my fourth semester, I had accepted a job as youth minister at Fairview Baptist Church in Coushatta, LA. When I first started working with that group, I knew next to nothing about teaching the Bible. I shudder to think about those first years of lessons, but, through it all, I sought to stay faithful to the Word of God. God was gracious. I grew in my love of Scripture as I studied texts each week. Granted, my method of teaching was horrible, but God still moved in my life and, I pray, in the lives of those youth. He was leading me deeper into service, and he was using this Bible to keep me steady. God developed in me a passion for holiness as I read Scripture along with faithful commentaries and books. I can remember using that Bible the first time I spoke in front of the BCM as well as throughout those years of leading family groups. This was the Bible I was reading when I came across 1 John 2:6, which proved to be a major influence in my life. That verse became the theme verse for BCM family group lessons in the fall of my senior year at NSU. I remember meeting with Bro. Bill, our BCM director, each week to write the family group lessons and to eat chile rellenos, every lesson being built around the concept of walking as Jesus walked. This verse was part of the text that Dr. Newsom preached on when I visited NOBTS, and, consequently, the verse that helped confirm my calling to seminary. And this verse has become a constant challenge for my walk with the Lord, its words continually calling me to delve deeper in love for God and in obedience to God. This is the Bible that I carried with me into seminary. When I moved to NOBTS, I moved in with friends, but I still found myself feeling lonely. I’d left behind some of the closest companions I’ve ever known, and, while I loved the guys around me, I felt like I’d lost my sense of community. But, again, God spoke through this Bible. Though I didn’t spend as much time in the Word as I had before, The Word was still there. Through the classes and devotions and sermons of those first months of seminary, God flooded my heart with his Word. During some of the most difficult times of my life, when I thought I might lose my best friend, God comforted me through his Word. During some of the best times of my life, while I grew together with three close friends in accountability and fellowship, God challenged me through his Word. When I couldn’t find a job, God sustained me through his Word. When I was called away from the path I thought I was supposed to walk and was led back into youth ministry, God grew me through his Word. As I’ve learned how to be a better expositor and teacher over the last couple of years, facing new challenges in ministry and in life, God has equipped me through his Word. As I’ve had the opportunity to preach and teach others the truths God has shown me, God has humbled me through his Word. Through the variety of blessings and trials, successes and failures, God’s Word has constantly been with me. In some ways, this copy of the Bible reflects my journey. The book of Romans is almost completely underlined. A piece of the page containing Romans 8 is worn away from where my thumb used to rest while teaching. The pages containing the book of James are filled with notes, some faded and yellowed, from the continuous things God showed me as I hid the letter in my heart. Certain passages in the Old Testament have notes referencing New Testament connections. Flipping through the pages of this Book is a bit like flipping through the pages of my life over the last few years. Every note, every mark, every underlined passage has been used by God to make me who I am today. These are just three verses out of one-hundred and seventy-six that speak of the beauty of the Word of God. I’ve grown to cherish this Book more than any other because through it I come to better know the Author. I bought a new copy recently. A wise pastor and writer encouraged me to buy a new Bible so that the Lord could speak to me afresh, apart from my notes from previous lessons. I’m excited about what God will do through these fresh, clean pages, and I look forward to many years spent studying the text, gleaning truths from each passage as God continues to sanctify me. I don’t doubt that the journey will continue, because the message is the same. The cover may change, the pages may be different, but the truth remains constant.